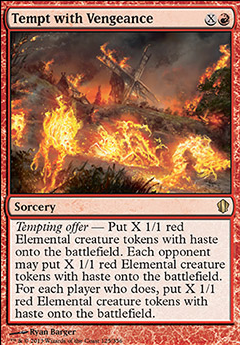 Tempting offer — Put X 1/1 red Elemental creature tokens with haste onto the battlefield. Each opponent may put X 1/1 red Elemental creature tokens with haste onto the battlefield. 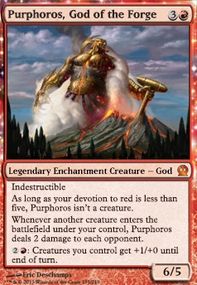 For each player who does, put X 1/1 red Elemental creature tokens with haste onto the battlefield. @Alkadron a little while back I got to play this deck against the group that I draft with. We did two pods of 4. 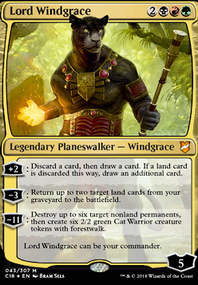 Most people in the group dont play commander regularly so a few of the decks were either prebuilt or hastily thrown together. The first game was the only one that was really interesting. I was playing against a gruul deck with Grand Warlord Radha as the commander, a slightly modified Edgar Markov deck and an esper deck, I forget who the commander was. What ended up happening was the vampire deck got a vampire the gained +1 counters when creatures died. The esper deck then made a copy of it. I saw an opportunity to make the game more interesting and I cast Tempt with Vengeance with the x being 10. Everyone chose to make tokens for themselves. There were now 70 tokens on the field, and I chose to swing out at everyone. They all just traded there tokens for mine. This made the two vampires absolutely massive, but they didn't have trample or flying and ended up just sitting there doing nothing, waiting for something to let them start oneshoting people. I was the first victim, shortly followed by the esper deck. Then out of nowhere the radha deck went from almost no board state to having everything and stole the game from the edgar markov deck. 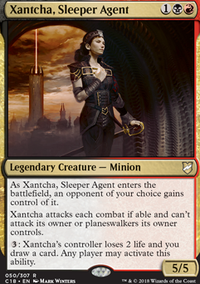 @goldlion, I think most of the stax would be sort of irrelevant. You don't need harsh mentor if people aren't going infinite. You don't need thorn of amethyst if people aren't trying to storm off. Or Trinisphere. Etc. I think you can sub out most of the stax for some bigger payoff finishers, and it'll work well in that kind of environment. 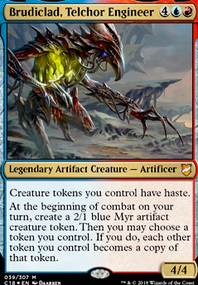 You can also run more token makers so it functions sort of like a big-mana combo deck. 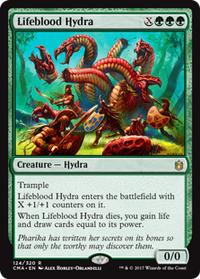 Stuff like Chancellor of the Forge and Tempt with Vengeance are good; the planeswalkers are good; Tendershoot Dryad is ok. Then you can run some payoffs like Triumph of the Hordes and Shamanic Revelation . It's a pretty strong deck like that. Bane of Progress and Knollspine Dragon . I mention these in the write up above because they're sort of natural includes in a Radha deck if you're building for a less competitive meta; they don't work great in competitive but they do work well in more 75%-ish metas. Maybe Tempt with Vengeance? 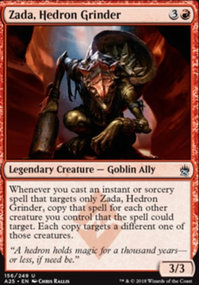 Grenzo, Havoc Raiser for some goad redundancy. Phyrexian Infiltrator has in its activation cost thus is Dimir color identity. And maybe if your playgroup tries to hate you out of the game Stunning Reversal might help leave you in it to keep the fun rolling. Rite of the Raging Storm is a must in this deck because every turn you get a death trigger for Omnath and then your opponents get something to swing at each other. Also Tempt with Vengeance is an extremely easy and powerful way to arm yourself with tiny elementals.